Main Street Liberal: The Elephant In The Room May Be Money. Yes, they did want the U.S. out of Saudi Arabia, though Riyadh begged to differ. They also wanted to kill people, especially Americans, sort of a glaring omission in the author's analysis. Werleman spent eighteen paragraphs absolving not Islam but the entire Muslim world of any responsibility for terrorism in the Middle East.while finding space to condemn "Harris’ dehumanization of the Muslim world." Werleman does note "People don’t join violent gangs because it’s a wise career choice, they join because in some cities, gang life is the only career choice" but then, apparently convinced Syria is just south central L.A. with desert, contends "ISIS is a gang that profits from racketeering, prostitution, drug running, kidnap ransoms, and extortion." ISIS is more than a gang, and something quite different. Though portraying ISIS as surviving only because of economic insecurity of its recruits, Werleman condemns the view of the Middle East as "endless violence and suicide bombers in waiting." Sympathizers of ISIS can't be blamed, he implies, but we cannot criticize the region (except, of course, Israel). ISIS, like Al Qaeda, is an armed and trained military group. Guns and training cost money, and this money came from somewhere. There are two Gulf states that finance Sunni militants — Qatar and Saudi Arabia. Both states use financial power derived from oil to build armed terrorist groups which then accomplish aims that their states cannot pursue openly. This occasionally slips out into the open. German Development Minister Gerd Mueller recently blamed Qatar, for instance, for financing ISIS. Qatar itself swiftly denied the charges and claimed it only funds Jabhat al-Nusra. Al-Nusra is the other radical Al Qaeda offshoot militant group fighting in Syria.In other words, Qatar denied funding ISIS by saying it funds Al-Qaeda. It’s a sort of ‘we fund the bad guys who want to kill Americans but not the really bad guys who behead them on social media,’ a non-denial denial by geopolitical psychopaths. In other words, ISIS got its start in Syria as part of the Arab Spring uprising, and it was financed by Saudi Arabia to go up against Assad. The Gulf states were using Syria to fight a proxy war against Iran, and the precursor of ISIS was one of their proxies in that war. It’s hard to imagine that today ISIS isn’t at least tacitly tolerated by a host of countries in the region, though its goodwill from neighboring countries may be running out. Today, ISIS may be self-sustaining, though it’s quite possible that money is still coming from conservative wealthy individuals in the Gulf states, money which originally comes from the West in the form of oil purchases. In other words, Middle Eastern politics, and much of Western politics, is organized around oil money. In its economic consequences, the oil gusher of Saudi Arabia was similar to the Chinese trade in the 19th century that led to the opium wars. In the that episode, the British bought tea from China, but China didn’t want anything but precious metals from England, leading to a drain of what was then reserve currency to China. This wasn’t sustainable, so England attacked China in what was known as ‘the opium wars’ and forced the government to allow them to trade opium, which addicted large segments of the Chinese population (and eventually led to today’s drug war). Revenue from opium then balanced the cost of tea. The money that went from England to China was ‘recycled’ back to England by the opium trade. International monetary arrangements require such recycling, though it does not have to be so brutal. In the 1970s, Saudi Arabia had something the West wanted — oil — but it didn’t want that much from the West. So we used a different kind of recycling arrangement (detailed by Tim Mitchell in his exquisite bookCarbon Democracy). Saudi Arabia got dollars, and those dollars piled up in Western banks like Citigroup, which started lending that money out to South American countries in the early 1980s. There were several other mechanisms to recycle what was called “petrodollars”. The arms trade really picked up in the 1970s, and continues today. Gulf states buy a lot of fancy weapons, which moves some of the dollars back to the West. They also have huge sovereign wealth funds, and buy Western corporations, banks, real estate, and assets, as well as the politicians that come with all of that. This ‘recycles’ dollars back out of the Middle East — Saudi Arabia returns some dollars, and in return it gets power and influence in the US. Foreign policy in the Gulf states is also organized around petrodollars. The Saudis don’t have to fight externally, they can simply fund terrorism against those they dislike. The Saudi state, like all states, isn’t a coherent whole, but a set of elites that interact with each other. There are thousands of ‘princes’ who basically just get oil income, but any of them can act independently and many of them do. It’s a bit like the CIA doing things without the President’s explicit permission; there’s a reason it was the CIA, the Saudis, and the Israelis financing the Taliban jointly in the 1980s. This has benefits, because then the Saudi state can have constructive ambiguity around its own role in financing terrorism. It also risks blowback, in that groups like ISIS or Al Qaeda can decide to take on the Saudi establishment itself. The relationship between Saudi Arabia and the United States is the most important diplomatic and military relationship that we have. The Saudis are the slush fund for whatever the US wants to do when it doesn’t want that activity on the books. It also fulfills an important role in the oil markets akin to that of the IMF in the international financial markets, by managing its oil surplus to ensure financial and economic stability. This means shifts in a mercurial theocratic kingdom where the Saudi monarch is in his 80s, and most of the population is young, poor, and extremely religious conservatives, can turn world politics on a dime. Right now, the Saudi government is still attempting to manage fallout from the war in Iraq and the Arab Spring uprisings, as well as the vacuum of power left when the United States withdrew from Iraq. It’s likely that at certain points it funded ISIS as one part of that strategy. Now you might think that the Saudi government financing a terrorist group with stated aims to attack the United States is a one-off, an accident. I mean the United States funded the Taliban in Afghanistan in the USSR in the 1980s. But you would be wrong. appears focused on persuading Turkey to crack down on the smuggling networks — some of which, one Western diplomat noted, “benefit a powerful Turkish elite” — and aiming at the refiners who would ultimately have to turn the crude oil into petrochemical products. But gathering the intelligence is a slow process, analysts say. For some reason, attacking the United States seems to be a goal of certain elements of the Saudi Arabian government and financial establishment. Parts of the Saudi government helped organize the attacks on the United States on 9/11 (or least that’s what Lawrence Wright of the New Yorker alleges). That, at least, was apparently one conclusion of the “Joint Inquiry into Intelligence Community Activities Before and After the Terrorist Attacks of September 2001", better known as the 9/11 Commission Report. Why wasn’t this front-page news? Because this particularly portion of the report, these 28 pages, were classified. Periodically members of Congress gripe about this. As early as 2003, Senators were demanding the Bush administration declassify this section of the report — Chuck Schumer, who has a security clearance and can read the report, pretty much said outright that Saudi Arabia was behind the attacks. 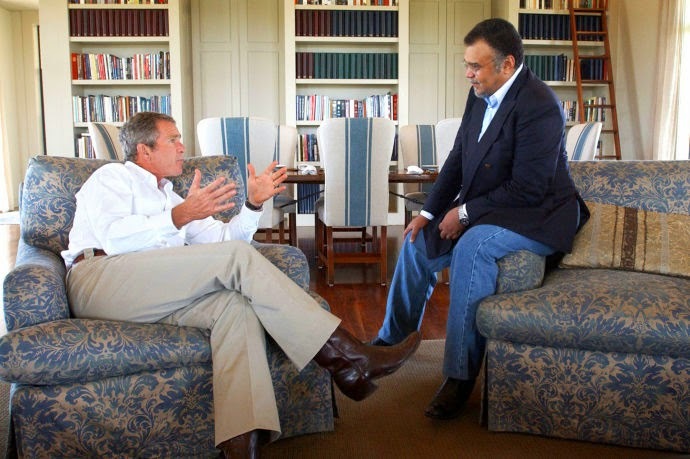 We can, as the Bush Administration did (and Stoller summarizes), enable and protect the Saudis (photo below from Eric Drapper/The White House via Getty of President Bush with the Saudi ambassador to the U.S.A. on 8/27/02 ). We might, as the Obama Administration is doing, turn a blind eye to the Kingdom. We could, as prefers Werleman, cast the USA as the Great Satan (and Israel as a lesser demon) and pretend Middle East terrorists are no more than street thugs and hardly Muslim at all. Or we could actually follow the money. That's a lot more difficult, but in the alternative, the region will remain unstable and a haven for terrorists and those who would bankroll them.